What is twist and ply? When choosing a yarn it is important to consider the twist and ply as this affects how the yarn behaves. Twisting yarn is the process of wrapping together (in a spiral motion) fibres to make a singles yarn and then singles to make a plied yarn. Twisting fibres together, such as when spinning, gives the fibres the strength to be woven in to cloth. Twisting these singles together to make a plied yarn adds even more strength. The ply of a yarn is the number of singles that have been twisted together to make up a yarn. A single yarn would have a ply of one. to be going in the same direction as the diagonal in an ‘S’ then it is an ‘S’ twist yarn. If they are going in the opposite direction then it is a ‘Z’ twist yarn. When yarn has been plied together the single strands are often ‘Z’ twist yarns which are then plied in an ‘S’ direction. If multiple ply ‘S’ twist yarns are then to be plied together, such as in a cord, they would be twisted in a ‘Z’ direction. Alternating twists in this way gives the yarn stability and strength. 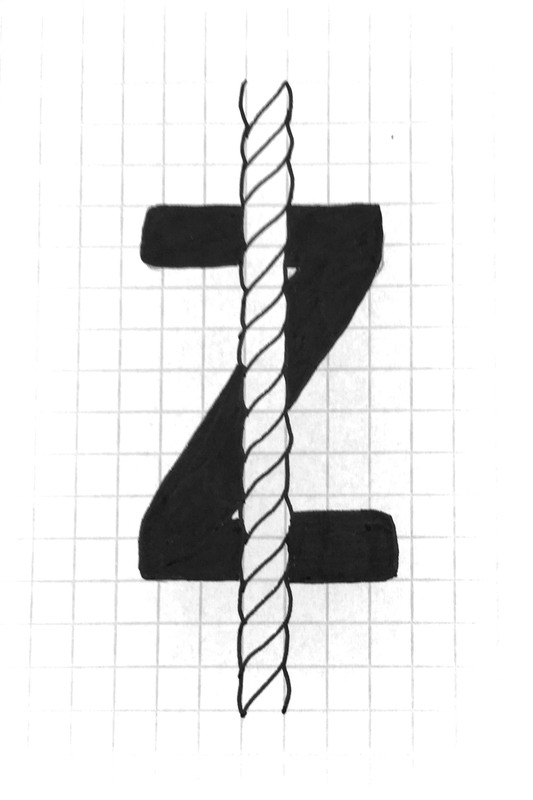 If a yarn is plied together using the same direction twist as the single strands, for example the single strands were twisted in a ‘Z’ direction and the yarn was also plied in the ‘Z’ direction the resulting yarn will have a tendency to curl. This is apparent in fabrics such as voile. The number of twists per meter is also important. This information is not always given with the yarn as standard but it will be displayed a TMI (twists per metre or TPI twists per inch). Some yarns are highly twisted and have lots of twists per meter while others are more softly twisted with less twists per meter. Shorter staple fibres will need a higher twist than longer staple fibres to give them the strength needed to be woven. As a yarn’s TPM increases as does it’s strength until it reaches it ‘optimum twist’ (different for every yarn). Optimum twist is when the yarn is at its strongest. If twisted more than this it starts to weaken. weakening the yarn in this way is sometimes necessary to create a desired effect. Voile Fibre spun in ‘Z’ direction with yarn also spun in ‘Z’ direction. High twist yarn which likes to curl but also creates transparency. Poplin Yarn which has been spun in an ‘S’ twist using two singles spun in ‘Z’ twists. Sewing thread is made up of three ‘S’ twist singles then plied in a ‘Z’ direction which creates a tear resistant yarn. Yarn counts can be a confusing topic but it is a useful piece of information. The yarn count tells us the thickness and ply of the yarn. All yarn has a yarn count although this is not so obvious in some yarns such as knitting yarn which are often described in words e.g. double knit etc. Counts are expressed as two numbers separated by a forward slash followed by the count system abbreviation e.g. 16/2 nm, 2/16wc etc. 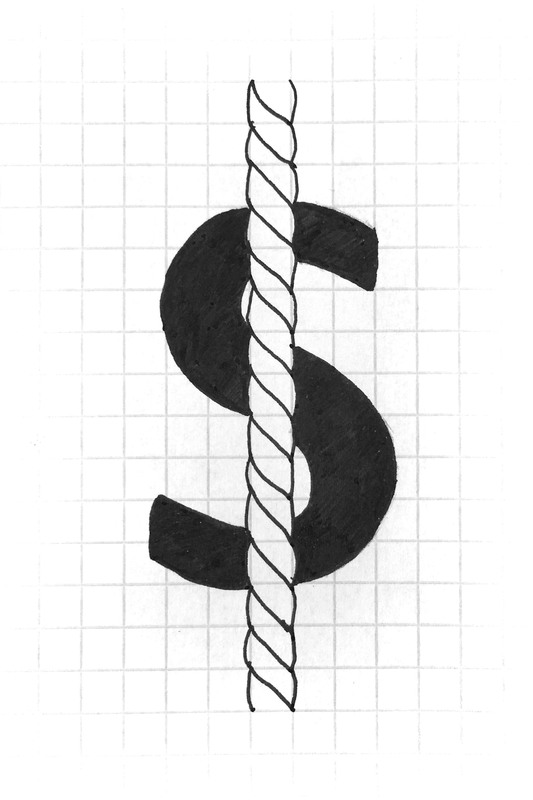 One number is the count, this tells us the length of yarn for a given weight of each individual strand of yarn. The other (usually smaller number) tells us how many strands of yarn have been plied together. Some counts may be expressed with the ply number missing e.g. 16 nm. When a count is expressed like this it is assumed the ply is 1. The twist is not measured within a yarn count as each manufacturer sets this themselves. The twist of a yarn is sometimes expressed separately as twists per inch (tpi) or twists per metre (tpm). There are many different systems used for measuring yarn. I am just going to cover the most common ones in this post. Although the different systems are commonly used for specific yarns they are often used for other types of yarn too. The numero metric count is particularly used across different yarn types. When yarn is plied there is a little bit of take up so the amounts may not work out exactly but in thinner yarns this is negligible. Being able to do this calculation is so useful because it enables you to work out how much yarn you are going to need for your project. 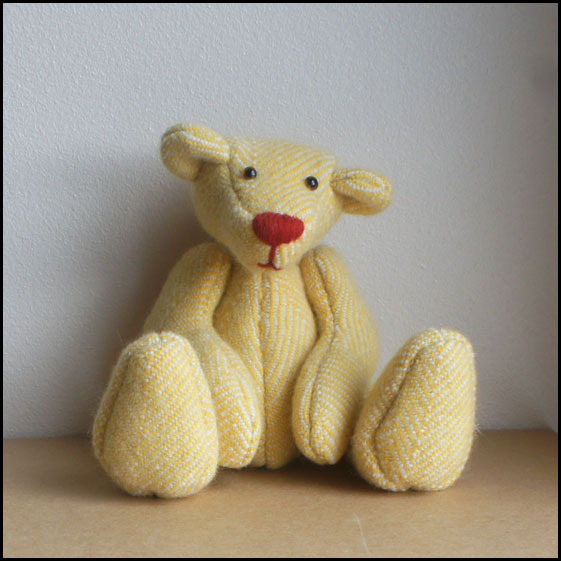 This is the final post in my blog series, I will show you how I stuff and finish my hand woven teddy bears. The head is the first bit I stuff and use a fibre filling. I cannot use glass beads as with the rest of the bear because the head droops with the weight. Once it has shape I then work on the hand stitched nose and glass eyes. These need to be placed precisely to create a cute and appealing face. When the head is finished it is then closed up, using a ‘drawstring’ technique. At the same time the first half of a cotter pin joint needs to be trapped inside. Cotter pin joints join all of the body parts together and allow them to move. The body, arms and legs are then all joined, but not stuffed, using four more cotter pin joints. As the joints are put in place it is important to get them tight but not so tight that it stops movement, so some adjusting is usually needed. The body, arms and legs are then stuffed and then hand stitched closed. I use small glass beads to stuff the body parts as it gives the teddy bear a beautiful weight and feel. Finally, each teddy bear has a Creative Threads button of authentication sewn on. I hope you enjoyed reading about how I make my hand woven teddy bears. If you would like to see any of the posts again they can be found here. 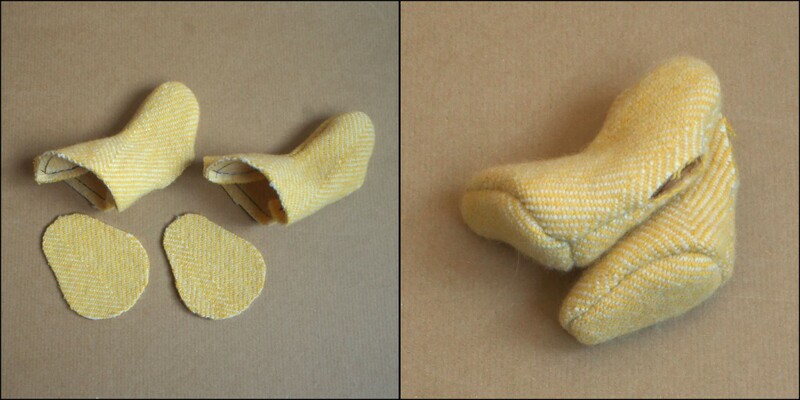 In this post you will see how the hand woven teddy bears start to take a three dimensional shape as I hand stitch the pieces together. 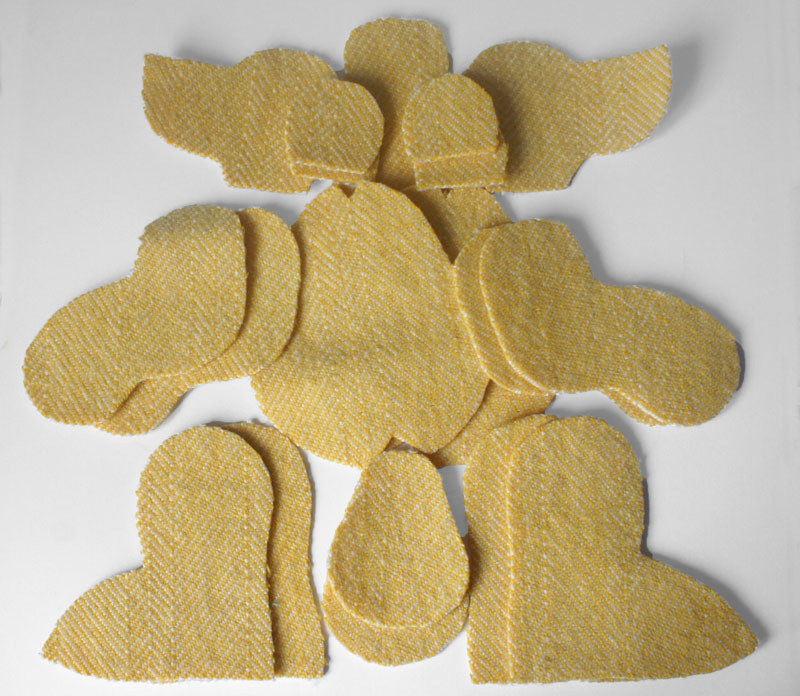 Due to the small size and shape of the teddy bears they all need to be sewn entirely by hand. I have tried sewing them using my sewing machine and although my it has great speed control it does not allow me to be accurate enough as I cannot see both sides at once and adjust the fitting. 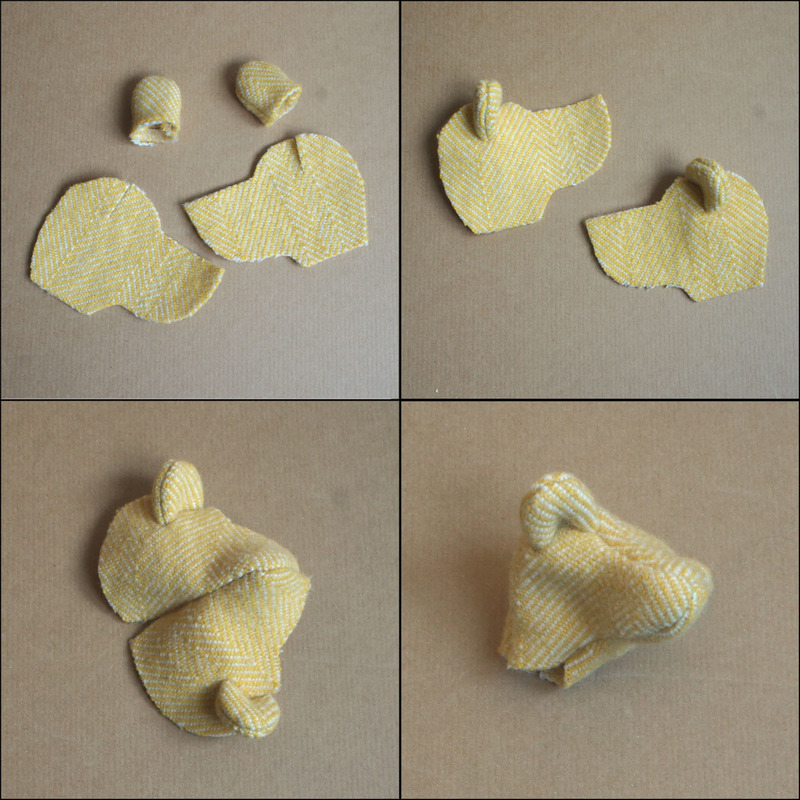 The pictures show the different stages of sewing the hand woven pieces together. I normally start with the head which has the most number of stages. I start with the ears before placing them on the head and then finally inserting the central head piece. Each piece has to be sewn accurately and lined up exactly. 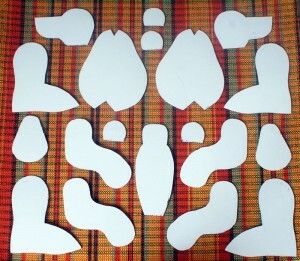 As you can see, the body pieces have small darts at the top and bottom. When sewn together these need to be lined up. For some of the more tricky parts, such as the head and feet, I tack (large loose stitches) them together so that they can be checked and adjusted to line up as I want them to. When sewn together I leave an opening in each body part. This is so I can insert the cotter pin joints which join the pieces together while allowing them to move around, and of course allows me to stuff the teddy bear. 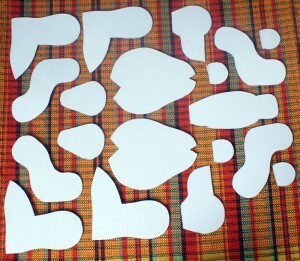 Look out for my next blog post when the teddy bear will really take shape with stuffing. 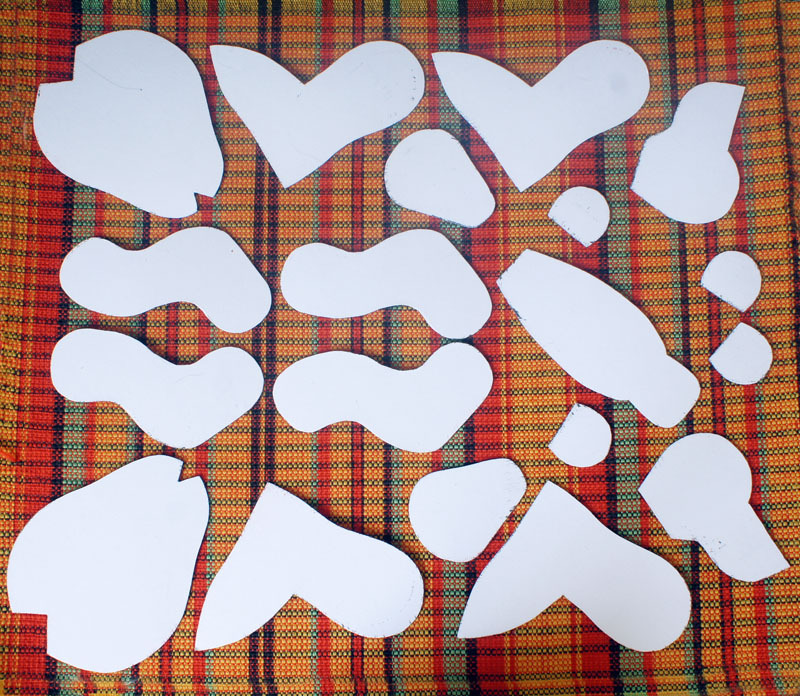 Cutting out the pieces for the teddy bears seems like a quick, simple step that doesn’t deserve it’s own post but it is a vital step that requires a lot of consideration. Once the fabric has been woven I wash and iron it. 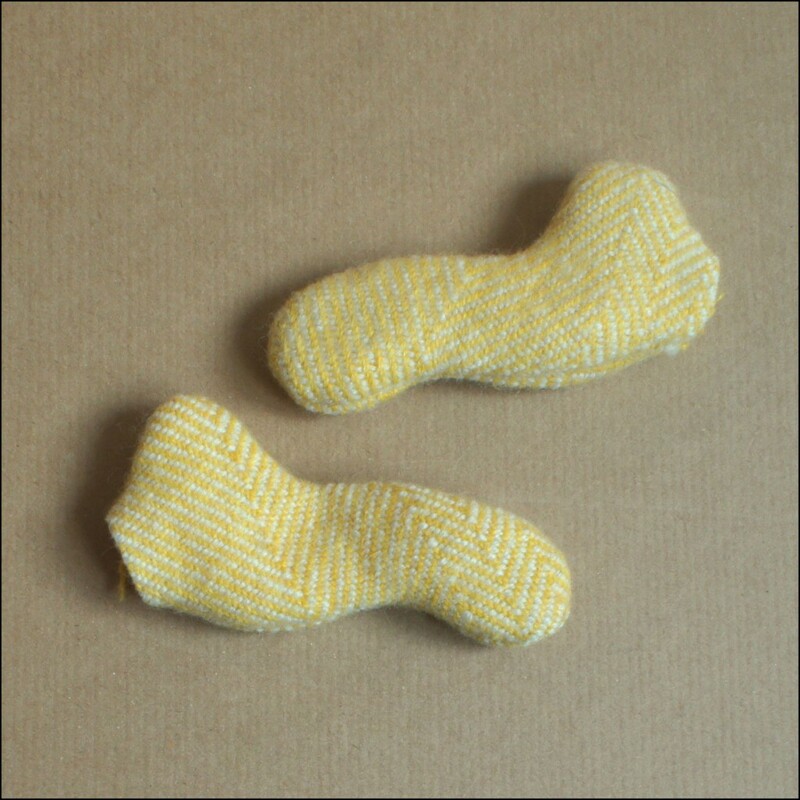 This softens the fabric and if it is a woollen fabric then it helps to tighten the weave. 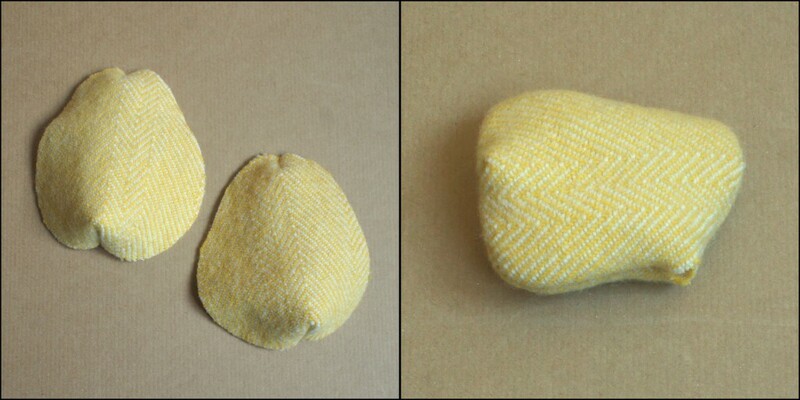 The images below show three different ways I might place the pieces on a stripy fabric. The first shows how the pieces would be placed for vertical stripes, the second horizontal and the third diagonal. All three would also be symmetrical teddy bears. 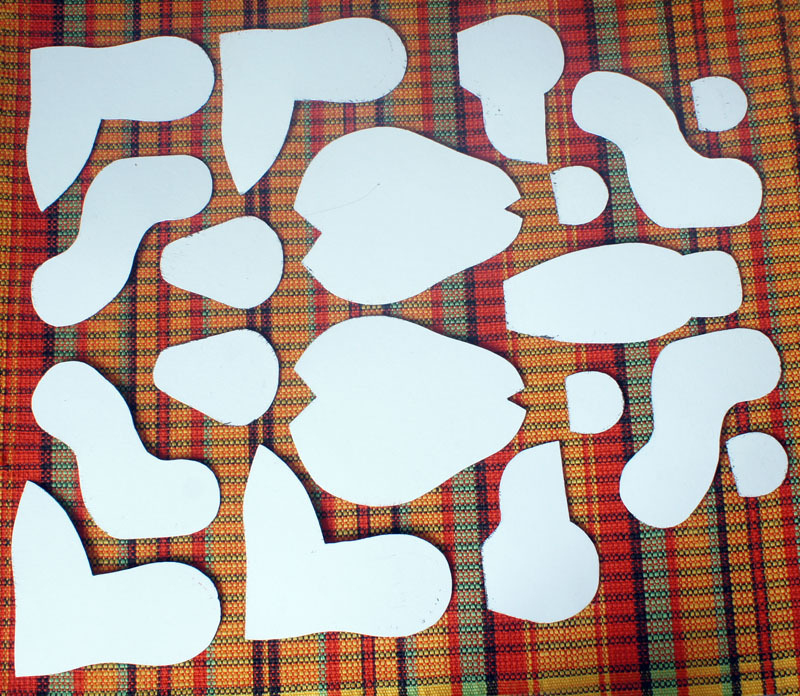 Once I have decided how I want the teddy bear to look and therefore how I am going to place the pieces they can then be cut out as shown below. The teddy bear is then ready to be sewn together and will start to take shape. 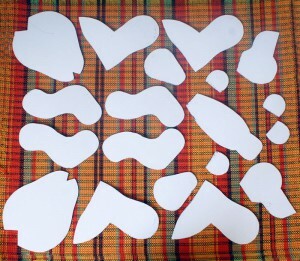 Have a look at my next post to find out about stitching the pieces together. In this post I am going to tell you how I hand weave fabric for my teddy bears. 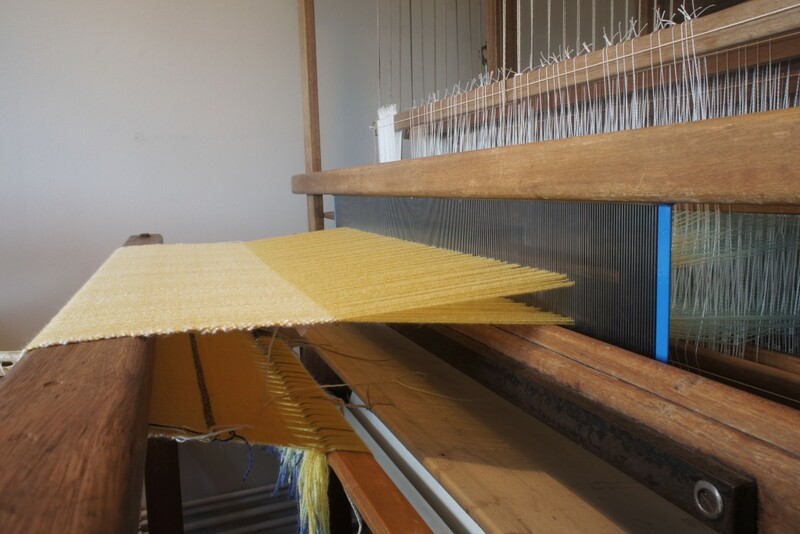 Once the loom is set up (as in my previous post) I can begin to weave my fabric. This time I am using a Countermarch loom but sometimes I will use different looms which means the weaving process is slightly different. For my countermarch loom the first this to do it set up the treadles underneath, this determines the structures I am going to weave. Each treadle needs to be tied to every shaft. The shafts contain the heddles and each of these ties will decide whether the shaft will be lifted up or pulled down, this is how the structures are created. When a treadle is pressed with the foot and the shafts lifted or lowered it creates a triangle shaped gap in the warp called the shed. 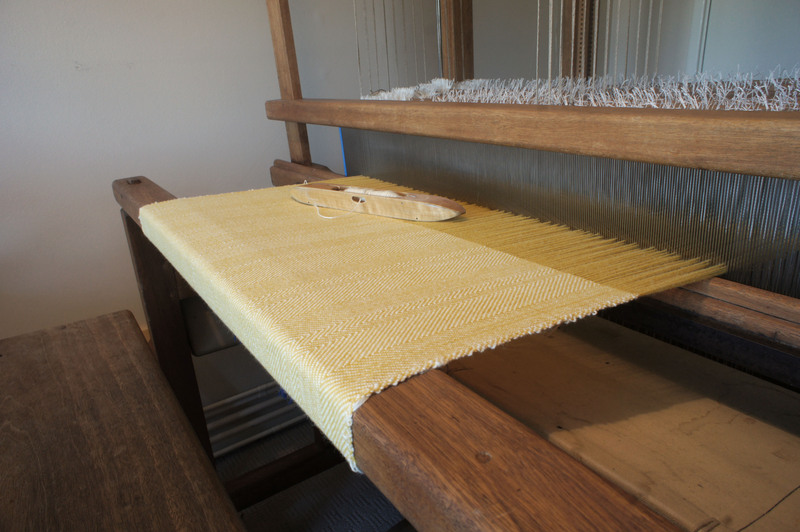 A shuttle containing the weft (horizontal threads) is passed through the shed, the fabric begins to be woven. The treadles are pressed in a certain order depending on what I am weaving, sometimes all twelve treadles will be used, sometimes only four may be needed. 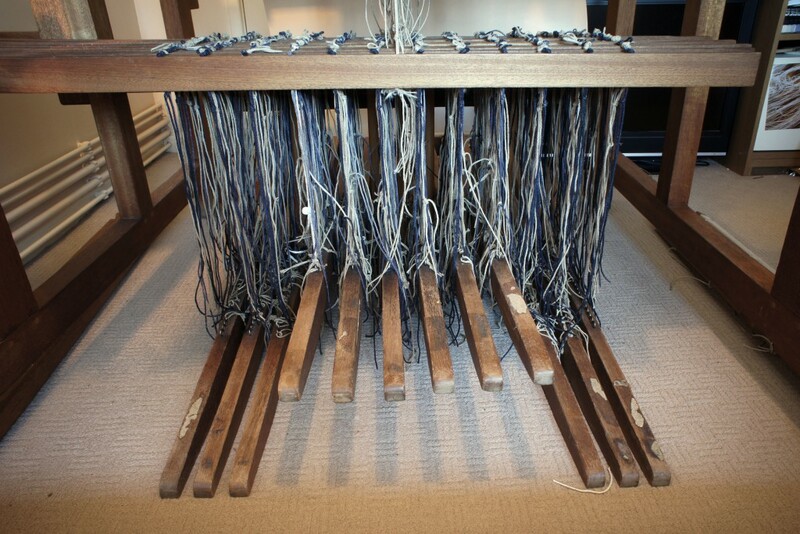 As more and more weft threads are interlaced with the warp threads the fabric grows longer. I will weave a few different fabrics from the same warp. 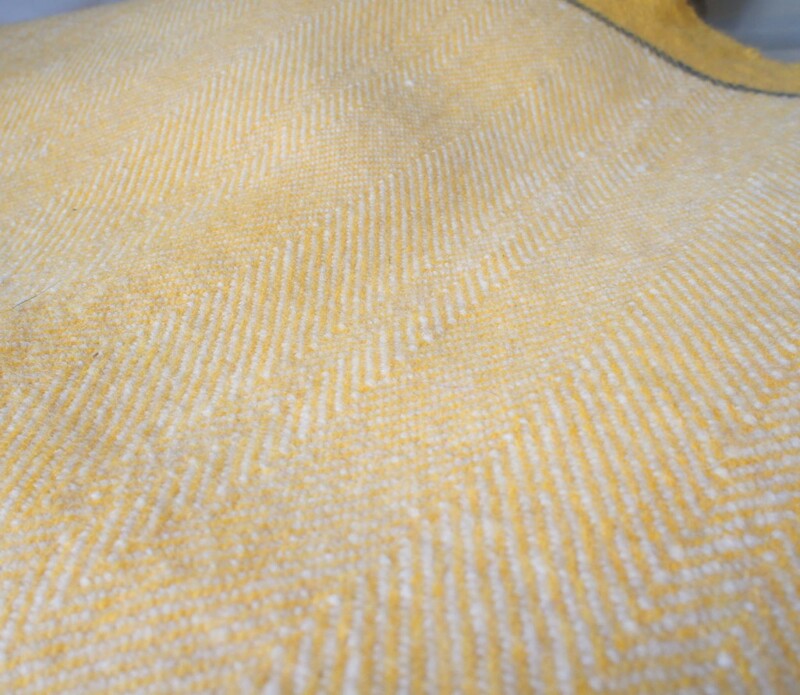 Using different patterns and weft threads means I can produce very different fabrics from the same warp.